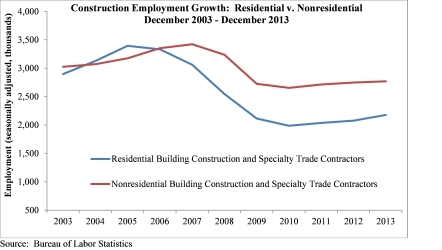 “It is discouraging to observe losses in momentum in both the broader economy and in nonresidential construction; however construction-specific and economy-wide employment data are likely to improve in the months ahead.”—ABC Chief Economist Anirban Basu. National construction employment decreased by 16,000 jobs in December, according to a Jan. 10 report by the U.S. Department of Labor. Nonresidential construction registered the bulk of job losses, contributing 88.1 percent of total construction industry job loss and losing 14,100 positions on a monthly basis. The national construction unemployment rate grew to 11.4 percent on a non-seasonally adjusted basis compared to 8.6 percent in November and 13.5 percent one year ago. 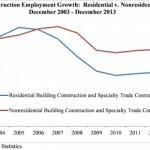 “It is discouraging to observe losses in momentum in both the broader economy and in nonresidential construction; however construction-specific and economy-wide employment data are likely to improve in the months ahead,” said Associated Builders and Contractors Chief Economist Anirban Basu. Across all industries, the nation added 74,000 jobs in December, with the private sector gaining 87,000 jobs and the public sector losing 13,000 jobs. According to the Bureau of Labor Statistics’ household survey, the national unemployment rate fell from 7 percent in November to 6.7 percent in December—the lowest unemployment rate since October 2008. Unfortunately, the unemployment decline is largely due to the labor force participation rate dipping back to its cyclical October 2013 low of 62.8 percent. Labor force participation is now at its lowest rate since March 1978. “Compounding the gloomy jobs number and the historically low labor participation rate, long-term unemployment reached 3.9 million, or 37.7 percent of the labor force,” Basu said. “While this is below the post-recession peak, it is still the higher than at any other time in the past 60 years. Nonresidential building construction employment fell by 1,200 jobs for the month but is up by 10,000 jobs (1.5 percent) since December 2012. Residential building construction employment rose by 4,800 jobs in December and is up by 26,800 jobs (4.7 percent) on an annual basis. Nonresidential specialty trade contractors lost 12,900 jobs for the month, but employment is up by 11,600 jobs (0.5 percent) from the same time last year. 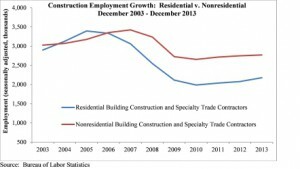 Residential specialty trade contractors gained 1,400 jobs in December and have added 73,000 jobs (4.9 percent) from December 2012. Heavy and civil engineering construction lost 8,800 jobs in December, but segment job totals are up by 500 (0.1 percent) on a year-over-year basis.